Grace. A beautiful, holy word with so much power and meaning. The word is filled with so much love and many fall short of realizing the love it holds, including myself. It is difficult for many to wrap their heads around that fact that we are ALL deserving of the Grace our Lord gives us. Grace is often misunderstood, or “under-understood” as I would put it. Grace is not just forgiveness, good manners, or mercy. Grace is so much more than that. Grace is truly the unmerited favor of God towards man (humans). We do not have to earn it, nor feel like we deserve it…His Grace is given to us. All He asks is that we receive it and take Him as our Lord and Savior. I personally struggle with the concept that I don’t have to “deserve” His Grace. There have been many times in my life where I feel like I have fallen drastically short to feeling like I deserve any of His love and grace. I have felt the lowest of lows…the bottom of the pit. I have felt unworthy, dirty, and empty but His love and grace are what save me every. time. That is the God we serve…His love is UNCONDITIONAL. There is not a thing we could do that could make His love for us any less. His love is always there. His grace is always there, and it is chasing US…YOU. All we have to do is receive it. We serve a God that loves us so much, that he would “leave the 99” for us (Matthew 18:12-14). This means that there is not one person that is more important than the other; sin is sin. All He asks of us is to recognize it and repent it. 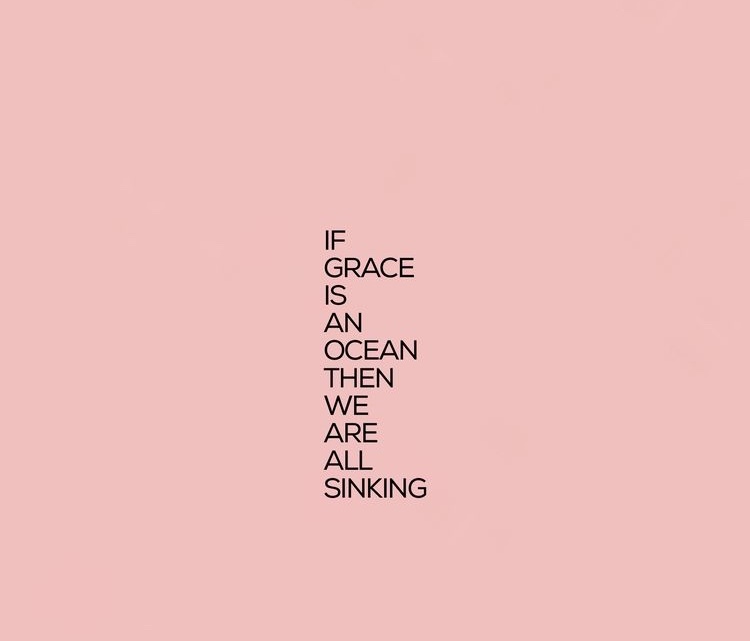 “If Grace is an ocean then we are all sinking” is a lyric from the song “How He Loves Us” by David Crowder. The lyric always stuck out to my husband and he was the first one to actually point it out to me. Every time this song comes on in our car, Brody gets fired up when that part is sung. His love for the lyric has become my love for the lyric. Think about it. His grace is SO great, so large and deep like the ocean, that we are all just sinking in it. UGH! Can I get an AMEN?!!! Now, believe it. His Grace is always upon you. Nicole has been justified — completely forgiven and made righteous! Now insert YOUR name in the verse and say it out loud. Speak it into existence! _____ has been justified — completely forgiven and made righteous.